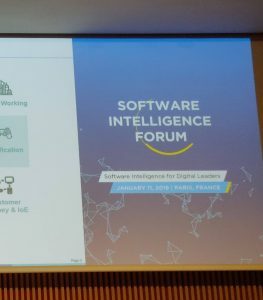 CAST Software’s annual January kickoff event in Paris, the Software Intelligence gives the media a rare insight into how some of the world’s biggest, and most prestigious, companies using static code software analysis to get ahead of the competition. Previously closed to outsiders, Positive opened the door a crack, giving a limited number of media the inside story, directement de source! A packed day saw speakers from IBM, Boston Consulting Group, TechMahindra and other giants share frank opinions on the challenges they faced and how CAST’s Software Intelligence helps overcome these. Client events, particularly of this scale and importance can be difficult to manage. Favourable press coverage is important but it’s also an excellent opportunity to learn more about your clients and get to know them and their products better than ever before. These priorities were combined for maximum efficiency with copious notes taken whilst listening to speakers. For additional value, when well-wordsmithed, these notes are ideal for for journalists unable to attend, giving vital access to the wider media community. Thinking through moves like this separates good agency value from great results, generating coverage in Forbes despite the correspondent not being available in person on the day. On the day itself, helping journalists know who they want to speak to and then making those connections is a key skill. We secured two interviews for the attending journalists during the lunch break of this busy day, giving them the access they needed to write the pieces they were looking to create. CAST CEO Vincent Delaroche and CTO Pierantonio Azzalini of Europe’s biggest shipbuilder, Fincantieri, were happy to offer their honest takes on the business landscape and the usefulness of software scanning. While the day turned to evening and the water on offer turned to wine, “Rouge ou blanc, monsieur?”, media relationships were forged which will last after the event ended. These new relationships bore strong coverage in the days and week after, particularly positive pieces being published in diginomica and Verdict. Working with all stakeholders in an international event can be a challenge. Preparation for yourself, attending journalists and all stakeholders can almost never start early enough. Start early with clear goals and figure out how what value the press will get from attending. Make the most of every spare minute. Time on the train, breakfast and break times are all valuable opportunities to get your ‘antisocial work’ like writing out of the way before valuable social opportunities with media and speakers. It costs time and money for top spokespeople and journalists to travel, even only across the Channel. You may be your own most interesting interviewee, others may quibble. Ensure the most interesting spokespeople are cleared to talk to the media, is the lure to draw the hard-working press corps to your event. Ensuring the most interesting spokespeople are cleared to talk to the media, is the lure to draw the hard-working press corps to your event.